Ok peoples. I want to do a future blog post that shares your franken polish creations that use either the colour morphing powders or spectraflair. 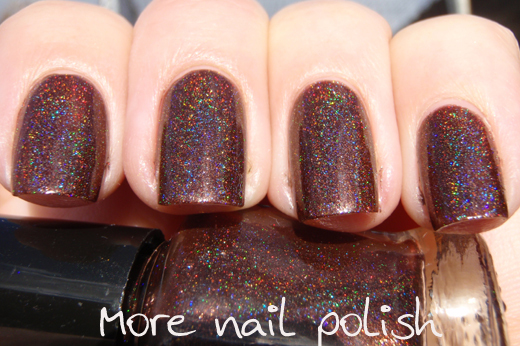 You see, today's spectrafranken was inspired by Cute-tickle Nails blog post about a wanting to create a deep chocolate brown holo. Her franken inspired this franken, and I want you all to be able to see what others are creating and get inspired with your pigments. My future blog post will have photos and links to your blogs and photos of franken polishes created using colour morphing powders or coarse grade spectraflair. I hope it to serve as a portal through to all your amazing polishes from one location. AND if you send me your link/photo then I will put you into a draw to win any three Picture Polish shades of your choice - and let me tell you there are some awesome PP shades to choose from! So, if you have a blog, you just need to email me a link to your blog post about one of your frankens (which use either a colour morphing powder or coarse grade spectraflair). You also need to give me permission to post one of your photos on my blog together with a link. If you don't have a blog, you just need to email me a photo of something you have created, swatched (preferably on your nail, but a wheel pic is ok too) and allow me to post that photo on my blog. Easy right. My email is morenailpolish@iinet.net.au and I'll give you two weeks to create something and send it to me. You can send me links after that date of course and I'm happy to update my post, but I will randomly draw a winner for the three Picture Polish shades on 14 October 2011. So now onto my franken polish inspired by Cute-tickle Nails franken polish. This is my 'frosted chocolate cake'. 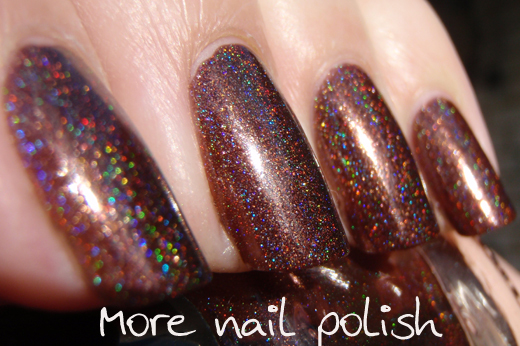 It's a deep chocolate brown, with a golden shimmer and pretty rainbow holo. 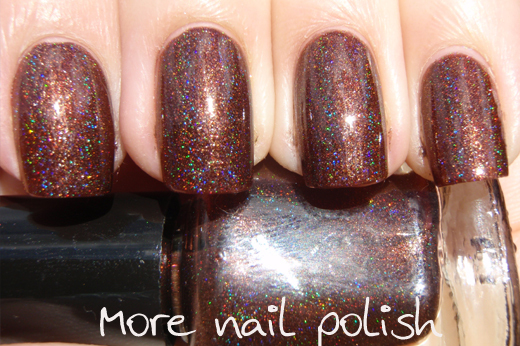 The TKB Copper Sparkes turned the creme Chocolate Cake polish into a shimmer, which I really should have swatched before I added the spectraflair, cause it was so pretty. Anyway, get frankening ladies, and lets inspire each other!! Hey, do you have to add pigments/sf? I have made some frankens using just polish and holographic glitter. 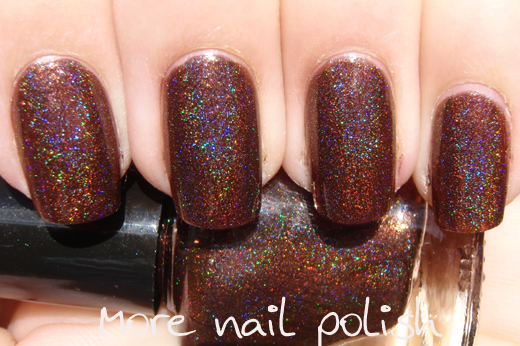 Wow, a dark brown holo - that's amazing! This is such a gorgeous gooey choco-laty color!!! Nice creation! Purple Fairy Dust - I just want to limit the page and the giveaway to people that have bought the coarse grade spectraflair or pigments. Mainly as a thank you to all those who bought them (250+ ladies) and cause I want people to get inspiration in how they can use the various powders. 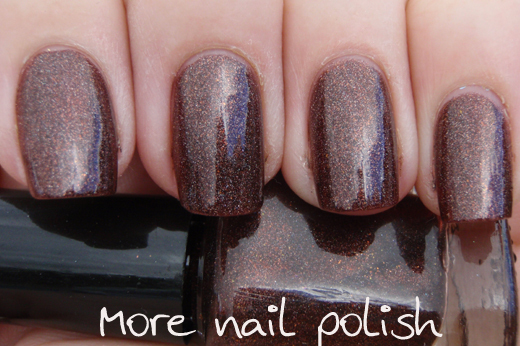 Kristy - thanks for the email, I think you have created some really inspirational polishes!! Oooh motivation :D I'm so on it! 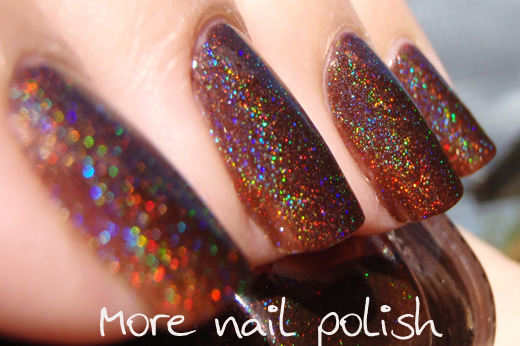 You blow my mind away with your holos!! !